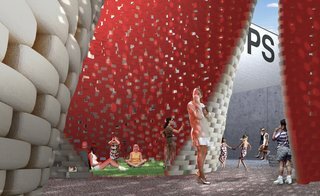 MoMA/PS1 announces its 2014 Young Architects Program winner, The Living, who will build a zero-carbon brick shelter in the museum's courtyard this summer. 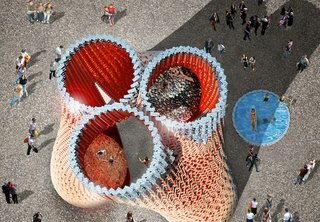 The Living is an architecture firm known in architectural circles for its futuristic, heavily conceptual architecture that draws on synthetic biology to create form and process. This week, the studio received a double-whammy honorific, snagging the competitive MoMA/PS1 Young Architects Program commission, as well as a place in the Architectural League's Emerging Voices roster for 2014. Speaking about The Living's temporary, nearly-zero-emission design for the courtyard of PS1 in Long Island City, founder David Benjamin, told us, "It's a venue that has a really wide audience, a popular audience rather than an academic or architecture audience. We think that’s really exciting because we’ve always imagined that our ideas and our research will live out in the world, and not just in an academic setting." 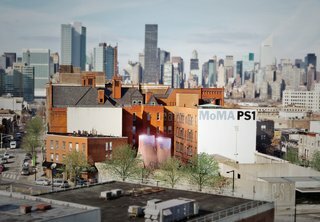 New York architecture firm The Living, led by David Benjamin, won this year's competitive MoMA/PS1 Young Architects Program competition. The firm will build its project Hy-Fi using biological technologies that create new building materials in a familiar shape: the brick. The other 2014 YAP finalists were Collective-LOK (Jon Lott, William O’Brien Jr., and Michael Kubo), LAMAS (Wei-Han Vivian Lee and James Macgillivray), Pita + Bloom (Florencia Pita and Jackilin Hah Bloom), and Fake Industries Architectural Agonism (Cristina Goberna and Urtzi Grau). With its revolutionary eco-bricks, The Living's structure "temporarily diverts the natural carbon cycle to produce a building that grows out of nothing but earth and returns to nothing but earth—with almost no waste, no energy needs, and no carbon emissions." Hy-Fi is a circular tower of organic and reflective bricks, where are produced through a combination of corn stalks (that otherwise have no value) and specially-developed living root structures, a process invented by Ecovative in collaboration with the architecture firm. The reflective bricks are produced through the custom-forming of a new daylighting mirror film invented by 3M. The Living principal David Benjamin says, "More than being a deliberate plan, this came together from a specific focus on building materials that are here and now and that are very tangible in what they’re trying to achieve. It returns to some of the classic elements of architecture—such as brick—and the project developed in that way, that we could explain it as reinventing the brick." Hy-Fi offers a familiar—yet completely new—structure in the context of the glass towers of the New York City skyline and the brick construction of the MoMA PS1 building. 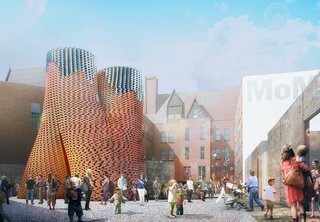 According to The Living and MoMA/PS1: "The organic bricks are arranged at the bottom of the structure and the reflective bricks are arranged at the top to bounce light down on the towers and the ground. The structure inverts the logic of load-bearing brick construction and creates a gravity-defying effect—instead of being thick and dense at the bottom, it is thin and porous at the bottom." The structure is calibrated to create a cool micro-climate in the summer by drawing in cool air at the bottom and pushing out hot air at the top. (Perfect for the dance parties which are held throughout the summer!) 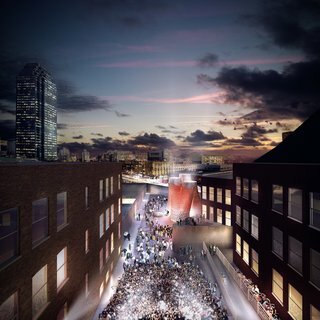 Overall, the firm promises that the structure will offer "shade, color, light, views, and a future-oriented experience that is designed to be refreshing, thought-provoking, and full of wonder and optimism."